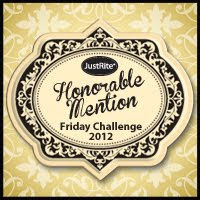 MaricopaStamper: JustRite Friday Challenge #087: Picture This! 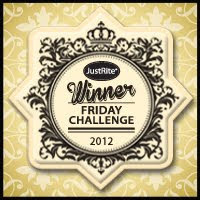 JustRite Friday Challenge #087: Picture This! The challenge @ JustRite Papercraft through 6 PM CST tomorrow is to use a photo in your project. 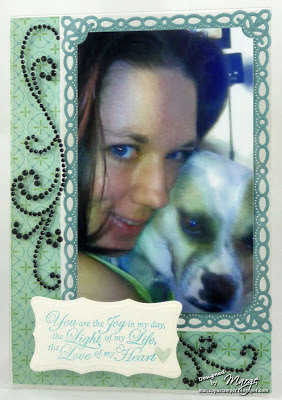 This could be a holiday photo card, mini book, ornament, or layout. 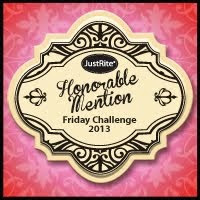 The best part of this challenge may be the PRIZES -- Spellbinders' dies -- 2 for the Grand Prize winner and 1 for each of 3 Honorable Mention winners and the Random winner will receive a JustRite stamp. So if you have a chance, come join the fun!!! My project includes a photo of my DD and their beloved rescue dog taken by her fiance'. I thought she'd like to have it framed for him to enjoy on his desk while working. I die cut/embossed aqua Bazzill CS with Spellbinders' Romantic Rectangles, glued down my photo and slipped it into the top right corner of my clear acrylic frame. I love that you can see through the pretty edging of the Romantic Rectangles! I measured the remaining space on the left and bottom and cut a piece of October Afternoon's Woodland Park DP in colors that coordinate with my photo to fill in the frame. Next I stamped what I think is a perfect sentiment from Wedding Nested Sentiments (retired JustRite original set) in aqua ink on cream CS. It was die cut/embossed with Spellbinders' Polka Dot Frame, using only the inside cut-out from the smallest frame. A small glittery heart from my stash was added and foam dots to pop it out from my frame for dimension. Finishing it all off are black rhinestone finesse swirls from Want2Scrap. I think this will make a nice little gift for DD's fiance' and if they want, they can easily change out the photo. Agree with Sheri this is a lovely gift. A perfect picture framed perfectly. This is so special. I love how the photo and the sentiment work together. I bet she'll cry when she gets this, I know I would. It's beautiful !! Marge, you did it again. I really LOVE this. Your DD's fiance' would love it too. That sentiment is perfect for that photo. Marge, this is gorgeous and so is your DD, looks just like you too! The frame is gorgeous and the sentiment is perfect you are right. My Sheri Crafts Challenge #100: It's A Wrap!